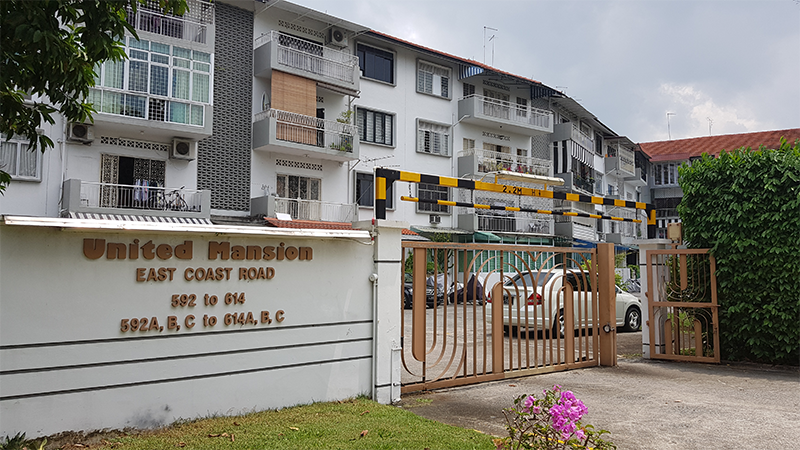 SINGAPORE, 9 April 2018 – United Mansion at 592 to 614 East Coast Road, Singapore 458996 - 459007, located in the heart of the exclusive Siglap / Frankel estate, has been put up for collective sale. Cushman & Wakefield, the appointed marketing agent, is pleased to announce that 89.5% consensus in share values and strata area has been garnered to launch the site for sale by tender. United Mansion is a freehold site with a land area of 5,135.2 sq m (55,275 sq ft approximately). The site is within a “3-storey mixed landed” housing area, according to the Master Plan 2014 and is allowed to retain its current 4-storey building height along with its verified Gross Floor Area of 6,129.33 sq m (65,975 sq ft approximately). The site can potentially yield 87 apartment units with an average size of 70 sq m gross floor area, subject to relevant authorities’ approval. The property is within walking distance from the hip and happening Siglap neighbourhood, the ‘Holland Village of the East’, with plenty of eateries, gourmet coffee joints, lifestyle, creative and enrichment centres for children. Parkway Parade and I12 Katong mall as well as the charming heritage shophouses in the Siglap, Joo Chiat and Katong areas which hosts an eclectic mix of classy restaurants, boutique cafes and food centres for local bites is also a short drive away. Several reputable schools such as Ngee Ann Primary School, CHIJ Katong Convent, St. Patrick School, Victoria Junior College, St. Stephen’s School and Global Indian International School are within a 1km radius. The site is strategically located and easily accessible via the Pan Island Expressway (PIE) and the East Coast Parkway (ECP) which also directly connects to the Raffles Place Central Business District and Downtown Core. The tender will close on 9 May 2018 (Wednesday) at 3.00pm.